Our company was established with the aim of offering health services with high quality and reasonable prices to people living abroad. "Be Healthy, Stay Happy" is our motto and we give all kinds of services to achieve that. We are working with specialists to your health in Istanbul where Asia connects to Europe. Our goal is giving you all quality health services you need for your health and happiness with affordable prices and extend our "Be Healthy, Stay Happy" motto with you. Approximately 1,5 months ago, my weight was 103 kg. 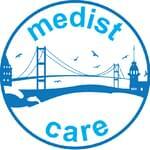 Then, I have a bariatric surgery in Istanbul through Medistcare International Health Services. I lost 18,5 kg. I didn't have any problem about sutgery. They took me from airport and got me to the hospital. I have my surgery in luxury hospital. Now, I feel good and day after day I am losing weight. I want to thank Medistcare.